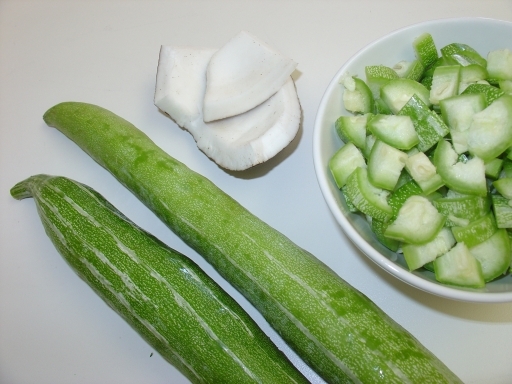 Anapakaya or sorakaya which is commonly known as bottle gourd is technically known as calabash, is a vine grown for its fruit, tender young bottle gourd fruits of certain varieties are eaten as a boiled vegetable. The fresh fruit has a light green smooth skin and a white flesh. The fruit are often cooked with lentils, curries and also used in making desert. 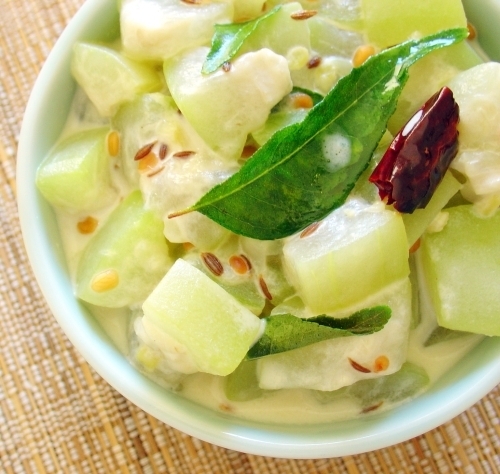 Bottle gourd is popular summer squashes in India. The best are slightly sweet, tender, and free of bitterness. Gourds are high in fiber and low in fat and cholesterol also contains good amount of Vitamin C, Riboflavin, Zinc, Thiamin, Iron, Magnesium and Manganese. 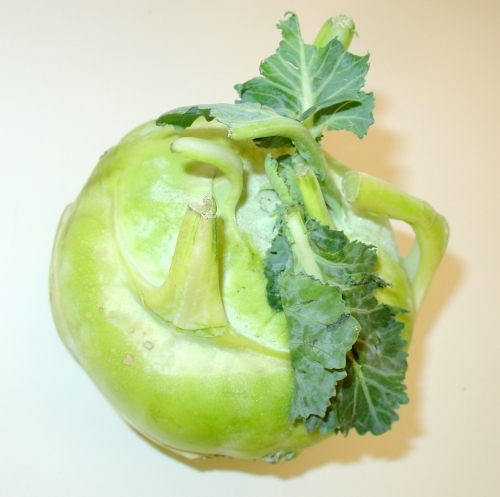 Bottle gourd in India is also known as Lauki and Dudhi. I use Anapakaya a lot in my house; it is a must to buy vegetable in my weekly veggies shopping. I make sambar, pappu kura (cooked with lentils), curries, pachadi (chutney) and stews with this lovely squash. Anapakya palu kura is a light and creamy curry, mildly spiced with ginger is from Andhra Pradesh most commonly cook by vegetarians. This sweet summer squash goes really well with cream/ milk just melts in mouth. Even though I don’t like this particular dish a lot but it’s my son’s favorite. This dish is really easy to prepare and also a good side dish for quick meals. Both my mom & MIL prepares this curry same way . Peel and cut anapaya into cubes, remove the seeds if needed and keep aside. Heat oil in small frying pan add urad dal, red chillies and fry until the urad dal starts to turn light brown. Now add cumin seeds, hing and ginger, allow the cumin seeds to crackle. Add curry leaves and turn of the heat and keep aside. In a heavy bottom shallow pan add anapayaka pieces, salt and cook on low medium heat covered. Anapakaya itself contains lots of moisture so you don’t need to add any extra water. Keep stirring in between. If needed sprinkle some water to avoid burning. It takes 10-15 minutes to cook. Add fried seasoning and cream mix well, cook for 1-2 minutes and turn of the heat. This goes really well with rice and roties. Do not cook for long after adding cream it will curdle. You can use ghee to fry seasoning instead of oil to add extra flavor. Also you can add onions (chopped) along with seasoning, fry and then add to the cooked squash. Trichosanthes cucumerina is the botanical name for Snake Gourd; know as pottalakaya (in Telugu). This variety produces green skin fruits with white stripes, long and curved that appears like snakes hanging on the supports of the ground. This narrow , soft-skinned fruit can grow up to 10-20 inches long, the flesh inside the fruit is soft, taste bland and has a moist and lightly sticky flesh and has an unique smell. This subtropical vine or tropical plant grows very fast in warm climates and produces lots of fruits, which are named for its strikingly long fruits when compared to other vegetables, are commonly used as a vegetable ( eat boiled or curried) and for medicinal purpose.Snake gourd (Pottalakaya) contains some amount of water, good amount of vitamins and carbohydrate. Young fruits are harvested and cooked. It is most popular in the cuisine of South Asia and Southeast Asia. The shoots, tendrils, and leaves are also eaten as greens. 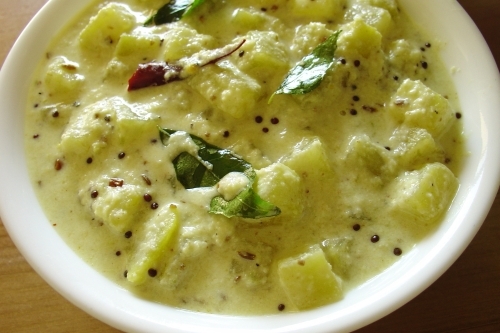 Pottalakaya is used a lot in South-Indian Cuisine (Andhra). This vegetable is used in making Koora (Curry), Pulusu (Stews) and Perugu pachadi (Yogurt chutney). Every family has their own recipe. Tender pottalakayya cooks very fast. Other names include serpent gourd, chichinga, and padwal. It is known as paduvalakaayi in Kannada and padavalanga in Malayalam. Wash, clean slit and chop pottalakayya (1/2 inch). On medium low heat, add chopped vegetable and salt to a heavy bottom pan and put the lid. Sprinkle little water if needed and keep stirring in the middle. Cook until done (do not over cook, it should have the crunch when you bite). Drain well if any moisture left and keep aside. Heat oil in a pan on medium heat, add urad dal, chillies once the dal starts turning golden brown add mustard seeds and allow them to crackle. Now add green chillies, curry leaves and coconut and sauté until the coconut turns light golden brown. Now add the cooked pottalakayya and mix well. Cook for another 3-5 minutes. Adjust the seasoning if needed. Turn of the heat and shift to serving bowl. This is a dry dish. Serve with rice. If you don’t like the skin, slightly peel and then chop. Do not add too much of water while cooking, this will turn the dish soggy. You can use frozen coconut instead of fresh one. You can remove the seeds if you don’t like, but tender ones tastes very good. Aloo (Hindi) are commonly known as potatoes. These wonderful starchy tubers are called Bangaladumpa, alugadda and urlagadda in Telugu. In general potatoes are very nutritious and low in calorie, fat and cholesterol free, which is also high in Vitamin C, potassium and also rich source of Vitamin B6 and dietary fiber, also best know for their carbohydrate content. In general a potato contains zero fat and a 5.3-ounce potato is only 100 calories. It is different kinds of toppings make the dish fattening. Potatoes are often considered as comfort food, also a staple food and the number one vegetable crop in the world. Potatoes are available year-around. The potato belongs to the Solanaceae or nightshade family whose other members include tomatoes, eggplants, peppers, and tomatillos. They are the swollen portion of the underground stem which is called a tuber and is designed to provide food for the green leafy portion of the plant. If allowed to flower and fruit, the potato plant will bear an inedible fruit resembling a tomato (Source Wiki). I love potatoes in all forms, fries, baked, roasted or curried. Potatoes are often used a lot in Indian cooking. It blends very easily with all other ingredients/ vegetables. I love them in all forms, few of my favorites are aloo methi, aloo paratha, sukhe aloo, bangaladumpa vepudu (potato fry), upma koora, bajji, bonda and the list keeps on going. This is my entry for Happy Burp’s “Jhiva for Potato”. Heat oil in 2 tbsp oil in a skillet on medium heat; add peeled potatoes (whole) and sauté the potatoes until golden brown all sides. Turn of the heat, drain and keep aside.In same skillet add 1 tbsp butter to the remaining oil, when the butter starts melting add onions, garlic and ginger and sauté until onions turn soft and browned. Remove from heat and cool. Grind onion mixture and keep aside. Grind almonds & khus khus with little water into a smooth paste. You can use regular potatoes instead of baby potatoes. Cauliflower is an awesome vegetable, which is low in fat and calories, high in fiber, folacin, potassium, water and vitamin C, have a very high nutritional density. Cauliflower is available year-round. Cauliflower is most commonly eaten cooked, but it may also be eaten raw or pickled. Cauliflower is so delicious and can be eaten in so many fun, simple and easy ways! 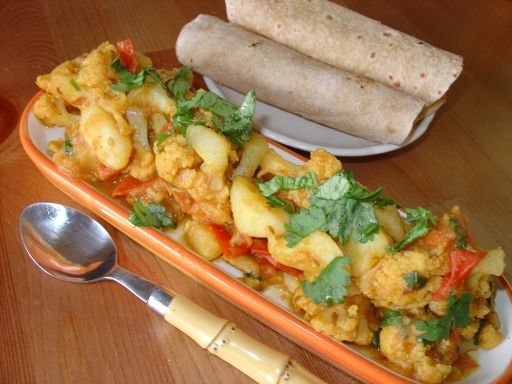 I often use cauliflower in soups, curries, manchuria and also make parathas. Yogurt adds a nice finish to this dish. I wanted to create a simple and easy dish to fix quick meals, and this was the end product!! Heat oil in a deep skillet on medium heat, add cumin seeds and allow them to splutter, add onions , green chillies ( if using) and turmeric and saute till onions turn translucent, add tomatoes and cook for 3-4 mins. To this add potatoes, peas and cook for 8-10 mins on low heat covered or cook till potatoes are 3/4th done, keep stirring in the middle, sprinkle some water if needed. Add coriander powder, chilli powder and cook for 2 mins. Add cauliflower florets and cook for 10-12 mins on medium-low flame covered. Once the cauliflower are done, turn off the heat and mix the yogurt. 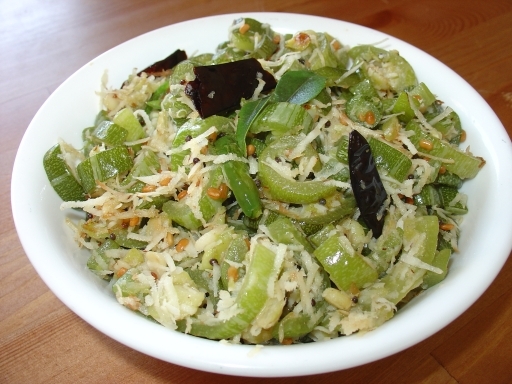 Garnish with corainder leaves and serve with rice or rotis. Add yogurt once you turn off the heat, otherwise it will curdle. You can also add little cream along with yogurt. If you add cauliflower too early it will over cook and florets will fall a part and make the mushy. Sometimes I really go crazy for brinjals. Its my all time favourite vegetable and also a comfort food. I make lots of varities with this vegetable. This one is a hit at my house. Fire roasted brinjals cooked with a simple combination of spices and herbs. Every region in India has their own version of baingan bharta, this is one is from Northern India. 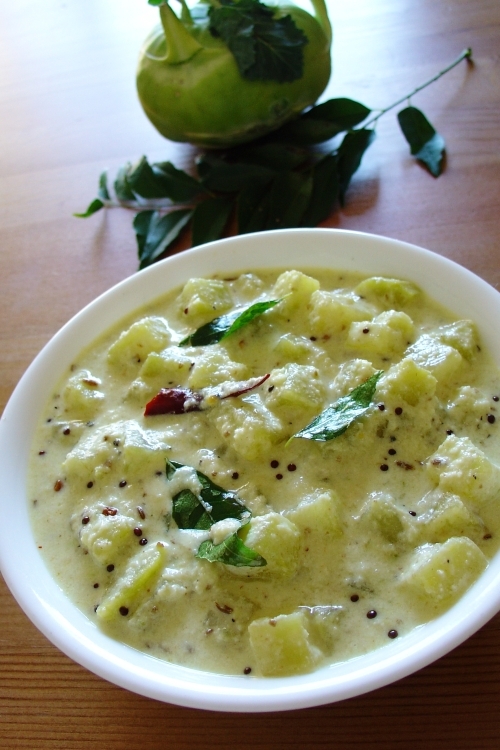 In Andhra Pradesh it is called Vankaya pulusu/pachadi. Select large brinjals with a shiny smooth surface as these are more likely to be without many seeds. Grease the brinjal(s) with a little oil and put it over an open flame till the skin chars. Keep rotating the brinjal so that it cooks evenly. I always keep the flame in medium-low so that the brinjal cooks slowly and completely. Remove from the flame and wrap them in a foil. Allow them to cool for 10 mins. Peel the skin and mash the pulp thoroughly and keep aside. Heat the oil and add the red chilli and cumin seeds. When they crackle add the onions and sauté for a few minutes. Add the ginger, garlic and green chillies and fry again for a few seconds. Add dry spices (turmeric powder, coriander-cumin seed powder and garam masala). Add the tomato and cook till the oil separates from the masala. Add the mashed brinjal, and salt and mix well, adjust the seasoning.Remove from heat and add lemon juice. Garnish with coriander, spring onions and serve hot. Also you can garnish with peanuts (dry roasted and crushed) and spring onions.You can can also add crush or diced tamotoes instead of fresh tamotoes. When you use canned tomatoes, check the taste before adding lemon juice, it will make the dish more tangy. You can broil/bake the brinjal(s) in the oven for 30-45 minutes till it turns soft (grease the brinjals and prick with fork all over the surface before putting in the oven). Temperature and time varies from oven to oven.